Our goal is to provide technical expertise and services to automotive enthusiasts with unique projects. Please visit our "SERVICES" page for more information. 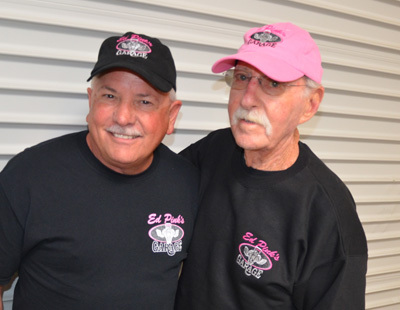 We'd also be pleased to sell you some of our cool Ed Pink's Garage apparel, as "modeled" by Bob Brandt and Ed. Visit our "PROMO" page to review the collection. If you have any stories or tidbits that you'd like to share, please visit Ed's FaceBook page and let's hear from you. The best thing about the racing world are the people.